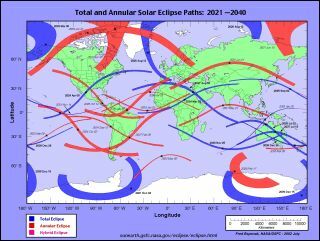 A map of total, annular and hybrid solar eclipses coming up from 2021 to 2040. Paul Sutter is an astrophysicist at The Ohio State University and the chief scientist at COSI science center. Sutter leads science-themed tours around the world at AstroTouring.com. Sutter contributed this article to Space.com's Expert Voices: Op-Ed & Insights. I suppose there is a small chance you'll miss the upcoming total solar eclipse as it crosses the United States on Aug. 21. Maybe you didn't hear about it. Maybe you forgot. Maybe you couldn't figure out how to travel to the line of totality. Maybe you couldn't be bothered to look outside. I won't judge — it's not the first solar eclipse in history, and it won't be the last. We would ideally get solar eclipses every month during the new moon, when the Earth, moon and sun form a nice, straight line. Unfortunately, however, the orbit of the moon is tilted with respect to the Earth-sun line, so we get these fantastic natural shows only every few years or so. After that, we'll wait until mid-century for another cluster of eclipses, with one in 2044 barely grazing Montana and one on Aug. 12, 2045, following a similar cross-country trek as 2017's. That one will give the southern half of the U.S. a better show, however. We then have to wait a few more decades until anything substantial occurs. The southeast will get a double dose in 2052 and 2078, and the northeast will get clipped again in 2079. Alaska gets a couple eclipses to enjoy by itself in 2033 and 2097. The last eclipse of the century, on Sept. 14, 2099, will be a half-hearted cross-country tour, entering through North Dakota, traveling just south of the Great Lakes and exiting via the mid-Atlantic. Here's the lesson: While there will be plenty of chances to catch a total solar eclipse in your own backyard in the coming century, a century is a very long time — at least in human terms. This year will be one of the best chances for the entire country to enjoy the show, with a large fraction of Americans within a day's drive of totality. Follow Paul @PaulMattSutter and facebook.com/PaulMattSutter. Follow us @Spacedotcom, Facebook or Google+. Originally published on Space.com.